The Young and the Restless spoilers tease that Graham’s (Max Shippee) complete backstory could prove to be shocking. Recent plot points confirmed that this character wasn’t Dina’s (Marla Adams) son, but Myrna’s (Marcia Rodd). Brent Davis (Bert Kramer) subsequently turned out to only be Graham’s stepfather. So who is his biological dad? John (Jerry Douglas) was Dina’s husband. She is known to have fooled around on him. Doing so with Brent resulted in Ashley’s (Eileen Davidson) birth, as was confirmed in the mid-1980’s. However, could it be that John’s response to Dina’s indiscretion led him to seek comfort in the arms of another Genoa City resident? Myrna was in town then and has since proven to be vengeful. Imagine everyone’s surprise if Graham is revealed as an Abbott heir! Victor (Eric Braeden) has an untold number of children. As of now, Y&R fans have been led to believe that Vickie (Amelia Heinle), Nick (Joshua Morrow), Adam (Justin Harley) and Abby (Melissa Ordway) were sired through three different women. But maybe Myrna was the fourth and Graham is his son? Y&R wrote Victor into the script in 1980, which was long after Graham would have been born. So, it’s plausible to believe The Moustache is almost anyone’s father. But is he Graham’s? Philip Chancellor II (initially played by John Considine, then by Donnelly Rhodes) had a tumultuous relationship with Katherine (Jeanne Cooper). Eventually he had an affair with Jill (currently played by Jess Walton), who had his son, Phillip III (Thom Bierdz). 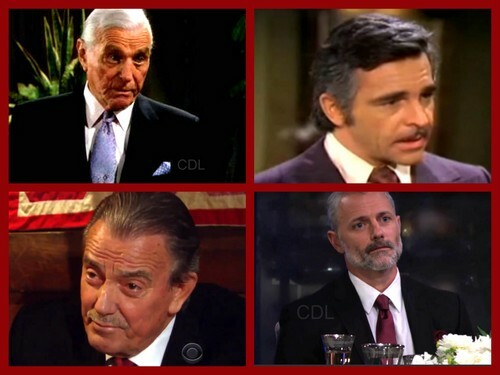 The idea that one of Y&R’s most old-school characters could be revealed as Graham’s father would have serious implications. The then renamed Mr. Bloodworth would be linked to the Chancellor fortune and also to Jill’s greatest love. Speaking of Jill, she shares a biological father with Tracey (Lauren Bregman). Neil Fenmore (Jim Storm, who later went on to play Bill Spencer, Senior on The Bold and the Beautiful) went to school with John and Dina. Using soapy logic, Neil is a viable candidate. A biological tie to both Jill and Lauren would link Graham to two longtime Y&R characters. It would also make him part of the Fenmore family, which includes its successful retail chain. The revelation that Jill and Lauren were sisters caused a major uproar a handful of years ago. This plot drop would create utter chaos. There are plenty of other potential options. The referenced choices provide fans with starting debate points. Since Brent was merely Graham’s stepfather another, as yet unnamed character is tied to him by blood. Since all involved parties are currently in Florida, will Myrna reveal that mystery man’s identity?